New technologies could help Utahns save water — but are we willing to use them? (Scott Sommerdorf | The Salt Lake Tribune) The older connections that come out in order to install Weber Basin water district's secondary water meters. The new meters were installed on a street in Westhaven today as part of a program to reduce water waste in their area, Thursday, April 26, 2018. How do you get Utahns, many of whom consider overwatering their yards a basic human right, to start conserving instead? Experts hope that another of the state’s great loves — technology — might hold the answer. So-called “smart” timers and controllers — devices that turn automatic sprinkler systems on and off based on weather conditions and other data — have huge potential to save water in Utah, according to researchers and government officials studying the devices. With some data indicating potential water savings of up to 50 percent, state water managers are now offering rebates to residents willing to install them at their homes — though it’s unclear how many people will be willing to use them. Save water wirelessly — but how much? Smart sprinkler controllers aren’t a new concept. Kelly Kopp, an extension specialist who studies water conservation at Utah State University, completed an evaluation of the first generation of smart controllers more than five years ago. Most work on the same basic principle. The devices are designed to take data, typically weather data and information about the user’s landscape, to determine how often and how long to run connected sprinkler systems. The main difference between older devices and the latest generation, Kopp said, is that the new smart controllers get their data wirelessly and are typically controlled via an app installed on the user’s phone. (Scott Sommerdorf | The Salt Lake Tribune) Weber Basin water district is installing secondary water meters as part of a program to reduce water waste in the area, Thursday, April 26, 2018. Jose Rodriguez installs two of the units that serve two adjacent houses in Westhaven. Studies continue, Kopp said, into their effectiveness, but she expects the latest devices to yield water savings comparable to older devices. Those controllers, Kopp said, use up to 50 percent less water than standard manual timers. Real-world studies, however, show slightly less-stellar results. About two years ago, the Weber Basin Water Conservancy District gave a handful of its largest residential water users free smart controllers and, in tandem with Orbit and other manufacturers, proceeded to monitor whether the smart controllers were effective in helping homeowners reduce water use. They were — but the water district saw only a 12 percent to 13 percent drop in water use. Darren Hess, an assistant general manager with the district, said he has seen more success with another relatively new technology: secondary water meters. Secondary water, unlike what comes out of a household tap, is untreated, and typically used only for irrigation. 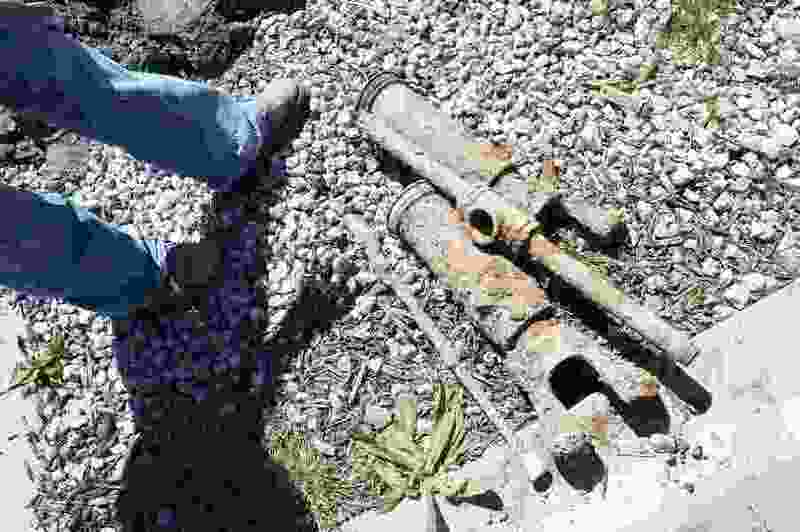 Not all Utah households have access to secondary water, but a sizable number do — Weber Basin Water has 18,000 secondary water connections on its system alone. These systems have historically been unmetered, creating a significant gap in Utah’s data on water use, because traditional meters have moving parts that can get jammed by impurities contained in untreated water. Secondary water meters don’t have that problem, meaning they function much longer and are more cost effective. The Weber Basin district, Hess said, is “aggressively installing” these meters, with installations cutting residents’ water use by roughly a third. And this isn’t because the water district is charging more for water; its flat fee structure remains unchanged. Instead, officials believe the sudden improvement in water efficiency stems from residents with access to unmetered water suddenly realizing how much water they’re using and cutting back. Running a single sprinkler system cycle once, on a quarter-acre lot, typically uses about 3,000 gallons of water, Hess said. Comparatively, the average Utah household uses about 6,000 to 8,000 gallons of water a month for indoor water needs, such as bathing or drinking. In other words, watering your lawn one time uses about half the amount of water an average household uses in an entire month, Hess said. And most Utahns likely water their lawns too much. Most summers, grass needs 30 to 32 inches of water total to thrive — that’s about two to three sprinkler cycles per week during the heat of the summer. But most people, Hess estimated, use 35 percent to 40 percent more water than they need. So the water district has been providing secondary water customers using meters with detailed monthly statements that show the difference between an estimate of how much water their lawn needed and how much they actually used. That additional awareness, Hess said, probably explains the 30 percent reduction. Right now, the Weber water district has about 6,500 secondary water meters installed, with plans to place another 11,000 water meters as time and money permit. Despite the meters’ conservation potential, Utah lawmakers have balked at requiring their installation on secondary water systems statewide. Instead, they have encouraged adoption of the new technology and provided low-interest loans for water systems that need assistance paying for the meters, which can cost in the range of $1,000 apiece. 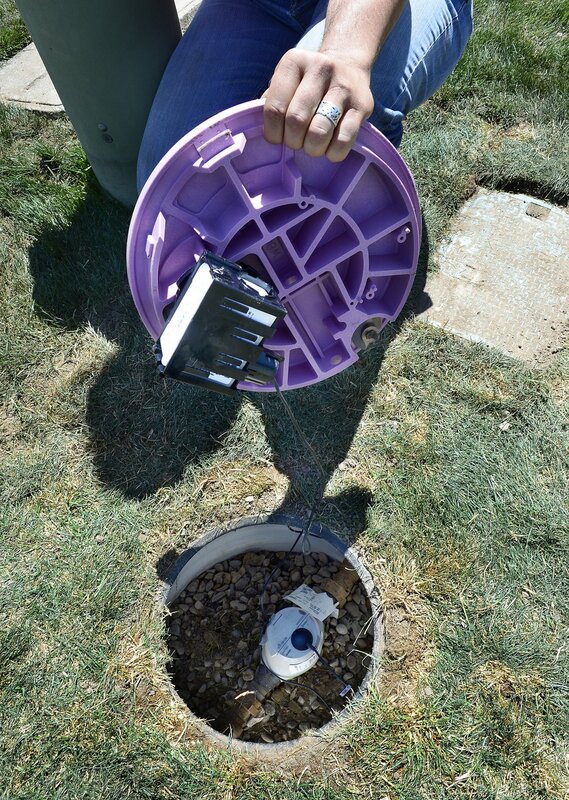 (Scott Sommerdorf | The Salt Lake Tribune) The unit that transmits the data on water use is seen attached to the underside of the cover, and connects to the meter below. Weber Basin water district is installing secondary water meters today as part of a program to reduce water waste in their area, Thursday, April 26, 2018. The state has also offered financial incentives for homeowners to buy and install smart controllers for their residential sprinkler systems. The Utah Division of Water Resources, with the assistance of the Jordan Valley Water Conservancy District, launched a new website, Utah Water Savers, earlier this month to distribute rebates covering up to $150 of costs to install new smart controllers for up to 8,000 Utahns. The site will help homeowners track down other rebates or incentives as well. According to Faye Rutishauser, water conservation coordinator for the state Division of Water Resources, the program could help Utahns cope with future water shortages due to climate change and population growth, while also decreasing the chances Utah will need large water development projects in the future, including a proposed series of dams on the Bear River. Some officials caution that smart timers are not a panacea. The devices work only as well as they’re programed to do — and users can accidentally set them incorrectly by providing inaccurate information through their apps, said Josh Palmer, a spokesman for the Division of Water Resources. In some cases, Palmer said, installing smart controllers could lead some homeowners who are otherwise diligent about water conservation to pay less attention to their usage. Wardle, who studied how consumers interact with smart controller products at Orbit, agreed that human interaction and attitude play a key role in the devices’ effectiveness. In one survey, he said, a quarter of participants reported eventually taking the devices out of “smart” mode and returning to manually watering their lawns. 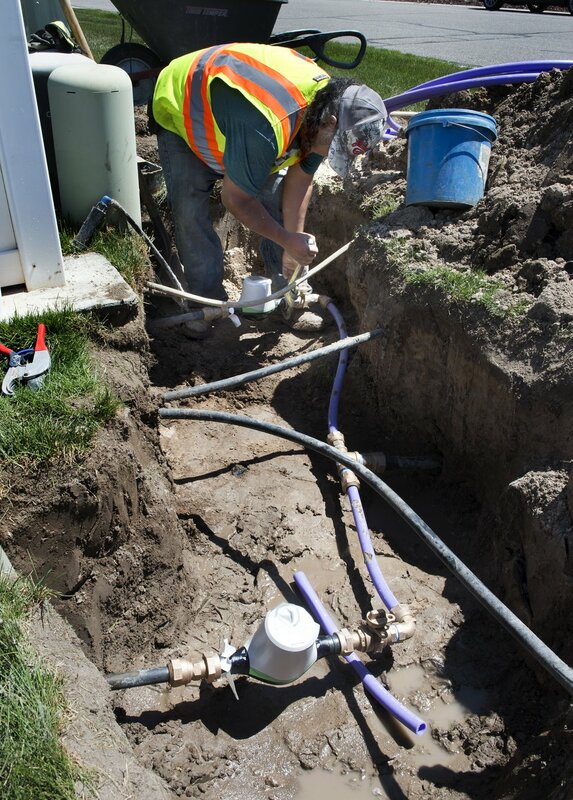 (Scott Sommerdorf | The Salt Lake Tribune) The older connections that come out in order to install Weber Basin water district's secondary water meters. The new meters were installed on a street in Westhaven as part of a program to reduce water waste in the area, Thursday, April 26, 2018. In that sense, Kopp said, one of the most powerful features of Wi-Fi-based smart controllers may also be a possible shortcoming. They’re interactive, and some devices require lots of external input, which opens up more opportunity for human error and may intimidate some users.